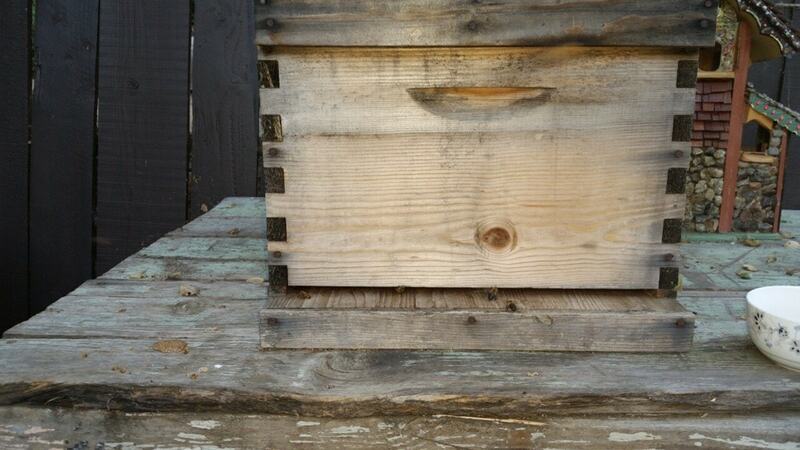 The second time, I helped split a hive and was taking care of the newly forming colony. They were in a nice spot, with plenty of water and shade. Then, one day as I was checking up on the ladies, I notice several yellow jackets going in and out. Long story short, they all absconded, leaving me with a box full of comb and nothing to do with it. As luck would have it though, I recently received a swarm catcher from a friend. After doing some light reading, I decided to post it under the nearby oak canopy. 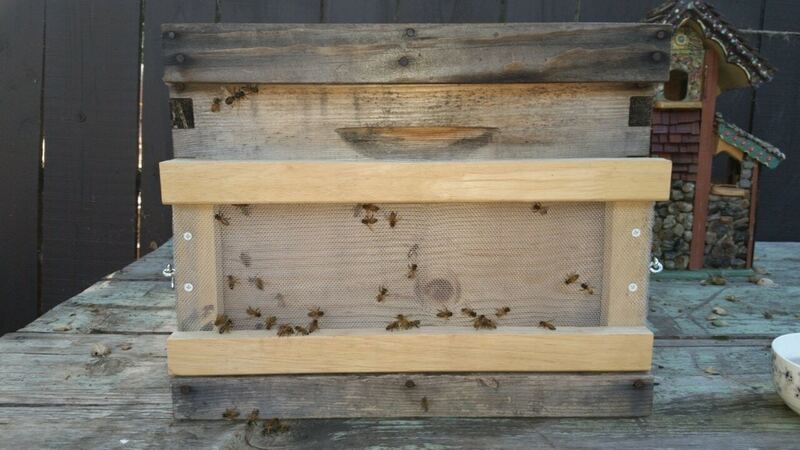 I added some lemon grass oil to the inside of the box as it is known to attract bees. Two weeks passed and I saw nothing more than a bee or two poking around the area. 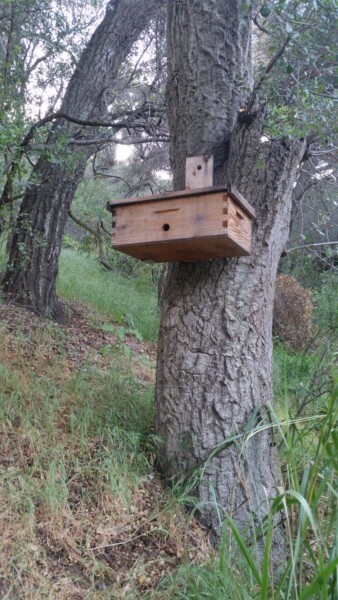 I was sure this would do it, since my friend had caught a couple of swarms with this box. Sadly, no luck for me. About a week later, I decided to look into cleaning up my old boxes since I put them away without much thought after the bee keeping yellow jacket defeat. Out of 3 boxes, one was full of comb BUT also full of wax moth trails. The second one had some comb inside but needed some cleaning, and the third was still new… I decided to throw out the first one as it would be too much trouble to clean up, left the second one on a table in the yard (so I could clean it later that day), and put the new one back inside. And off to a late morning hike I went. When I get back, I could not believe my eyes! The bee box I was getting ready to clean had some bee activity. Soon after that, it seemed like the number multiplied. So I waited till night time and made/installed a hive robber screen. This would protect the bees from, ideally, yellow jackets. It took the girls some time to get the new entry pattern, but worked in the end. Notice the drone bee on the top left of the box. I thought it was a queen till I realized there were about 4 flying back and forth… Still cool looking. Now I just put together a spot for them with some scraps and all is well, fingers crossed. 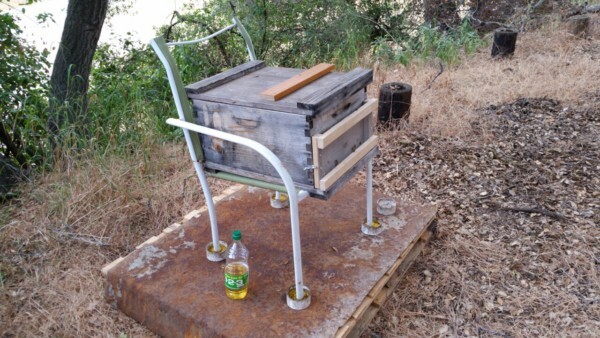 They are under an oak canopy, with water near by, and have the added security of a hive robber screen. I checked about a week later and there is definitely a queen in there and they are building up a storm! Third time may be a charm for this “bee keeper”. Till next time!